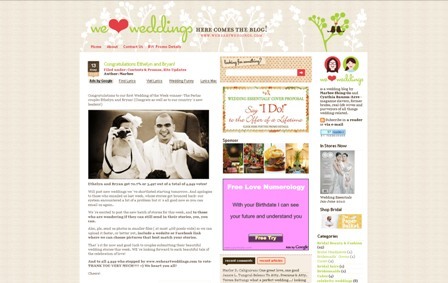 The country's most creative wedding blog, www.weheartweddings.com was unveiled May 18, 2010 at the Blue Leaf Pavilion Hall in Mckinley Hills. Look no further in search of eco-friendly, style-savvy to modern 21st century themes, weheartweddings.com is devotwww.weheartsweddings.comed to modern and innovative bride. The fun blog also features simple DIY tips and tricks to help you make your own wedding invitations, souvenirs and even corsages. From wedding photographers and garden venues to make-up artists and photo booth suppliers, weheartweddings.com has got you covered to help you have a beautiful, memorable wedding. We Heart Weddings' first online promo, titled "Say I Do to the Offer of a Lifetime" gives you the opportunity to be featured on the cover of Wedding Essentials’ Beautiful Weddings issue. Tell them how your wedding day was beautiful—from the gown you picked to the food you served—and YOU could be on the cover of Wedding Essentials’ Beautiful Weddings magazine! They will feature wedding stories at www.weheartweddings.com and throughout the week, readers will get the chance to vote on their favourite wedding story via an online poll. At the end of each week, They will announce the Wedding of the Week winner as determined by the votes received in the poll. This promo will run for ten (10) weeks ending in July 18, 2010. The WE Editorial Staff will pick five (5) of their own favourite wedding stories. These 5 Editorial Staff picks and the 10 Wedding of the Week winners will each receive a WE gift bag worth Php3,000 from our sponsors, AND be featured in our Beautiful Weddings -October Issue! BEST OF ALL, each of the 15 wedding stories we feature will have their own cover AND be invited to the Beautiful Weddings-October Issue Launch where they will receive one (1) complimentary copy of Beautiful Weddings with their own wedding on the cover. To participate, email bw10@weheartweddings.com. Weddings to be featured must have (1) already taken place last September 2009 or later and (2) a Philippine connection (must have 1 or more of the following: (a) a Filipino bride, a Filipino groom, or both; (b) a Philippine venue; or (c) at least 3 Filipino wedding suppliers). Entries must be (a) 600-800words in English, (b) express details of the wedding in blog or photo essay format in your own voice, (c) include 3 tips for soon-to-wed readers and (d) come with 8-10 photos and link to the Face Book or weddsite wedding photo album. For the full details on this promo, visit www.heartweddings.com. Don't miss out on this exciting event. Say "I Do!" to We Heat Weddings and get the chance to say "I Do" to the proposal of a lifetime! Visit www.weheartweddings.com for more information.